There aren’t many TV series that inspire such an army of fanatics . Doctor Who is one of those series. It has an army of loyal followers that will go over it in minute detail, debating who is their favourite of the Doctors and lamenting the loss of earlier episodes when BBC decided to wipe the tapes way back when. Then there are the people that see Doctor Who as the height of nerd-dom, more geeky than a Joss Whedon obsessed Starcraft fanatic. People who will refuse to give it a chance, based solely on the reputation upon which its fans pride themselves. I came into the cult of Doctor Who as an outsider, and while not foaming at the mouth at the sight of the good Doctor, I still found a lot to enjoy. Series Five, volume 4 contains the last 3 episodes of series five, so of course we get our massive finale which ups all the stakes and puts our lead characters in all sorts of mortal peril, but before that we also get two rather interesting character pieces. The first one is about Vincent Van Gogh, The Doctor (Matt Smith) and Amy Pond (Karen Gillan) visit The Netherlands investigating a picture of his which seems to have an unknown beast in the background. However once they get there they find that the universally respected artist is considered a horrible painter in his time, a drunk, and one who can’t afford the vast quantities he consumes. Frustrated by his lack of respect and his own crushing self confidence issues, Van Gogh reluctantly joins with the Doctor to combat the mysterious beast found in one of his paintings. It is a very interesting episode that uses time travel well, and treats Van Gogh in a way that does seem believable at the time. It also has a satisfying emotional climax, which really shows off the Doctors human side, and his growing attachment to them. The next episode centres on the Doctor lodging with Craig Owens (Gavin and Stacey’s James Corden), as there is another room in Owens house which people never come out from. This is more of a humorous episode, as the Doctor tries to pass off as human and join Owens in regular activities such as sitting around on the couch and playing football (something The Doctor picks up in no time). Once again though, it also has a sweet natured ending as The Doctor manages to bring Owens and his long time love interest together. The two part finale is a much bigger event based episode. This one brings back all of the popular Doctor Who enemies, such as the Daleks and the Cybermen. It also brings back Amy’s boyfriend Rory, and mysterious companion to the Doctor, River Song. There is a lot going on in these two episodes, plenty of action, drama and a few laughs of course. It also uses it’s time travel aspects very inventively as a part of the solution. Without giving away too much, it is a worthy finale and wraps most things up, but still leaves a few threads open for the next series. 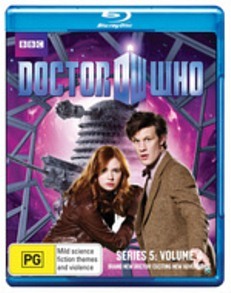 Compared to the DVD release, the FULL HD (1080i 16:9) release of series 5 volume 4 looks amazing. BBC continue to be the leaders in high quality broadcasts and everything from the colours, tones and images are crystal clear. To compliment this, we have Dolby Digital 5.1. Unfortunately for such an entertaining release, the extras are just as weak as the last instalment; another Monster Files is all that is on offer. It runs around ten minutes and is a pure puff piece. It will not be watched more than once. By the end of Doctor Who series five, Matt Smith has fully grown into the role and made it his own. Series 5 of Doctor Who is an enjoyable ride, especially for fans of science fiction. Showrunner Steven Moffat seems to have done the impossible, keeping the quality of a long running show up after the much loved Russel T Davies passed the torch. The last volume especially shows off the variety that Doctor Who brings in its episodes, which means there should be something here for everyone to enjoy.